It’s easy to imagine the people in Crazy Rich Asians eating at Din Tai Fung. 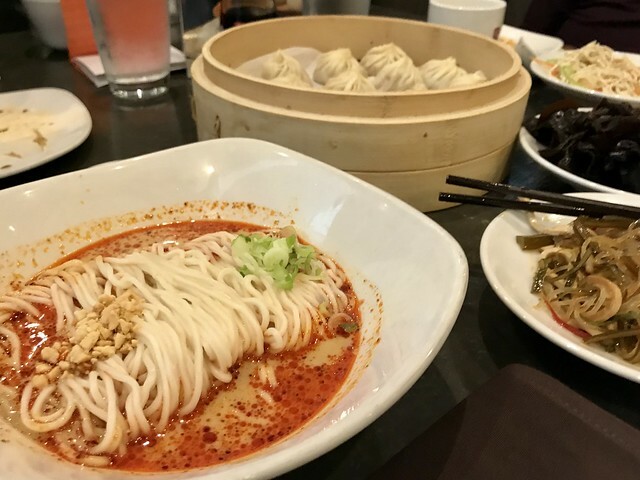 With its stylish interior and elegantly plated dishes, Din Tai Fung would definitely meet the standards of this jetset bunch. The Glendale branch of Din Tai Fung is located in The Americana at Brand. They offer a free valet service, so you can drive right up to the restaurant in your Tesla or Maserati (or in my case, a Toyota in need of a washing) and turn your car over to the valet. The valet will then text you your parking ticket, making holding onto a paper ticket obsolete. We had a gluten-free diner in our midst, so their famed dumplings were not an option for her. Unfazed, our waiter expertly steered us to the gluten-free offerings on the menu. Seaweed and beancurd in a vinegar dressing, wood ear mushrooms in vinegar dressing (yet again), sautéed string beans and sautéed spinach, both with garlic, kept her from starving while we eagerly stuffed our faces with gluten. Admittedly, the seaweed and beancurd and mushrooms are a bit of an acquired taste – those less adventuresome diners should probably steer clear (especially if they are cringing at the mere mention of them). The green beans are crowd-pleasers, cooked in garlic but still crispy. 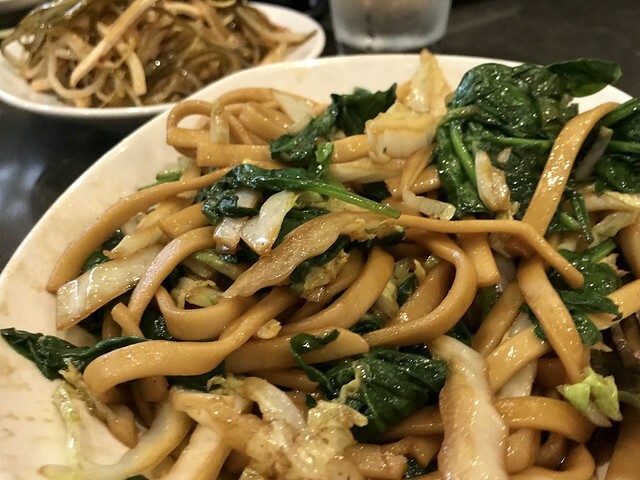 We always order the vegetarian fried noodles, even though they are nothing special. In spite of that, the small plate always goes quickly. 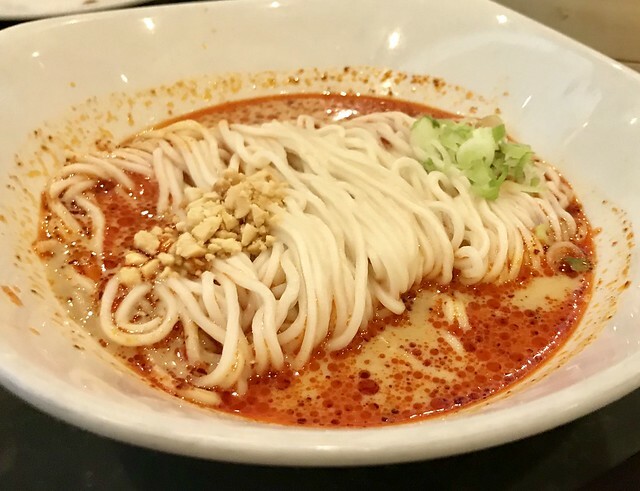 The serving of noodles in sesame sauce is more generous, slightly spicy and more interesting than the fried noodles. It’s probably one of my favorite dishes at Din Tai Fung. We also had a vegetarian dining with us, so we ordered the vegetarian dumplings. 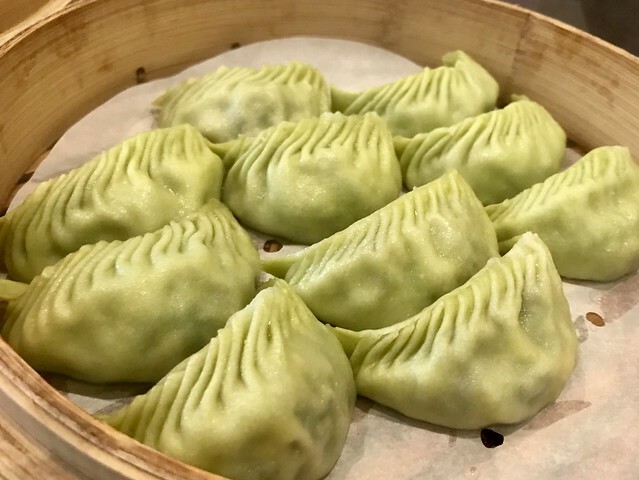 Encased in a green wrapper, they were pleated with the same exacting folds as their signature dumplings. However, there’s something about the taste of the wrapper, while pretty in green, that overwhelms the flavor of the filling. I always struggle to force these down when faced with them. 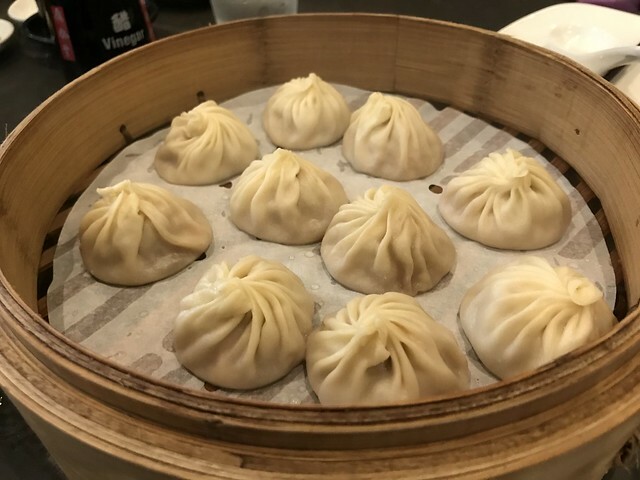 Their signature pork xiao long baos were the highlight of the meal. Ever so delicate, the dumplings oozed their soup when bit. For dessert, Din Tai Fung offers sweet versions of the steamed dumplings, buns and rice cakes. Somehow the waiter talked us into getting the red bean xiao long bao (not pictured here because they were quite unappealing in appearance). Like their pork cousins, there was a delicate wrapper around the black filling, reminiscent of peanut butter in taste. I was glad I tried it but am unlikely to ever order it again. You don’t need to be crazy rich, nor Asian, to enjoy Din Tai Fung. But it helps.